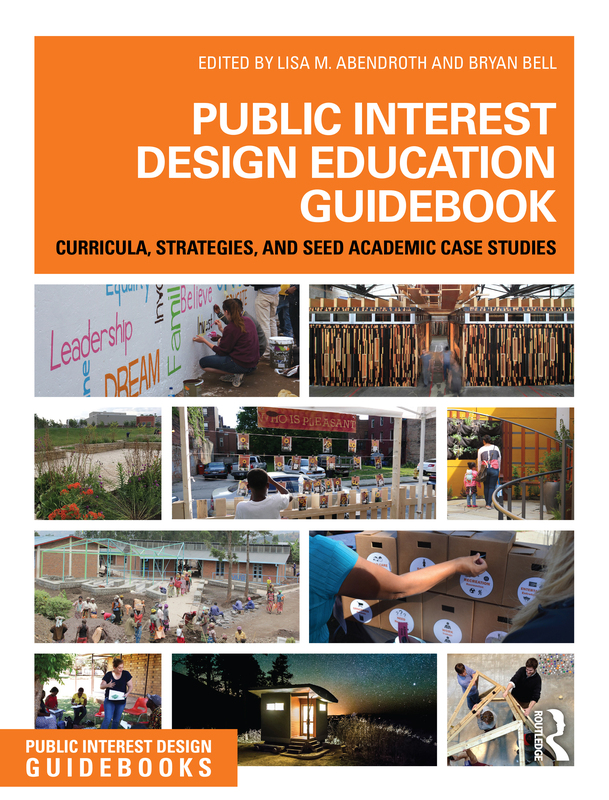 ‘Public Interest Design Education Guidebook: Curricula, Strategies, and SEED Academic Case Studies’ presents the work and ideas of over 60 thought-leaders that together are shaping a broad curriculum of public interest design. Written in a guidebook format that includes projects from across design disciplines, this book describes the learning critical to pursuing an inclusive, informed design practice. Featured chapter themes include Fundamental Skills, Intercultural Competencies, Engaging the Field Experience, Inclusive Iteration, and Evaluating Student Learning. 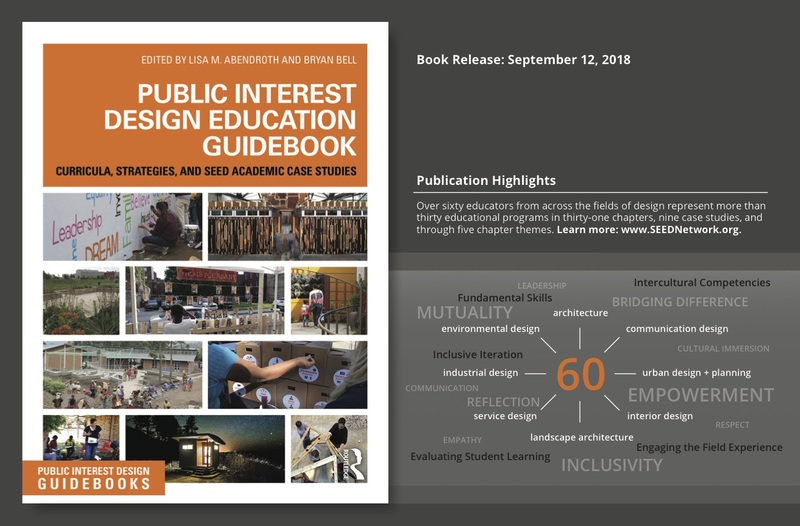 The breadth of projects and teaching strategies provides valuable knowledge for students of design, educators, and practicing designers in the pursuit of serving the public through design. Rahul Mehrotra; Lisa M. Abendroth and Bryan Bell; Jeffrey Hou, Benjamin R. Spencer, and Daniel Winterbottom; Mariana Amatullo, Dan Gottlieb, Penny Herscovitch, and Susannah Ramshaw; R. Todd Ferry and Sergio Palleroni; Bryan Bell, Robin Abrams, and Gene Bressler; Susan Verba, Sarah Perrault, and Tracy Manuel; Anthony Guido with Jeremy Beaudry, Jamer Hunt, Sharon Lefevre, Michael McAllister, and Jonas Milder; Maggie Hansen and Emilie Taylor Welty; Lisa M. Abendroth, Kelly Monico, and Peter Miles Bergman; Lee Davis and Mike Weikert; John Folan; Megan Clark and Shalini Agrawal; Pedro Pacheco; Ursula Hartig and Nina Pawlicki; Christian Benimana; Lisa Grocott and Kate McEntee; Deland Chan; Benjamin R. Spencer; Angus Donald Campbell and Naudé Malan; Brian Gaudio; Benjamin Peterson; Eduardo Staszowski; Paula Horrigan; Edward M. Orlowski and Julia Jovanovic; Chris Harnish; Nadia M. Anderson; Bethany Lundell Garver; Michael Zaretsky; Julie Stevens; and, Thomas Fisher. Design in Partnership with the Lama Foundation; Pleasant Street Pedestrian Project; A Social Approach to Design; Cooperative Education at the Detroit Collaborative Design Center; Com(m)a; The Farm Rover; On Site: Public Art and Design; South of California Avenue; and, With Sacramento.